HONG KONG, Oct 31, 2018 - (ACN Newswire) - Having experienced a period of unprecedented economic growth and rapid industrialisation, cities across the Chinese mainland are now facing challenges relating to their huge energy consumption and pollutant emissions. With plans for the development of the Guangdong-Hong Kong-Macao Greater Bay Area now gaining momentum, the issue of how to boost sustainable development and environmental protection is now becoming more prominent in all major cities in the Greater Bay Area. 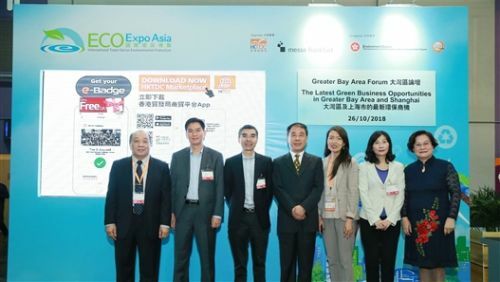 Staged as part of Eco Expo Asia on 26 Oct, the Greater Bay Area Forum highlighted the various green policies and environmental initiatives that are beginning to reshape Greater Bay Area cities, featuring government officials from Guangdong's Environmental Protection Bureau along with officials from Shanghai, another major city working hard to address environmental concerns. 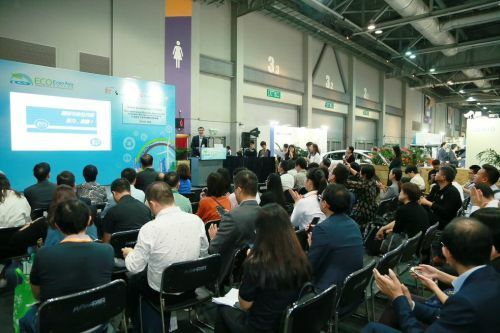 The 13th edition of Eco Expo Asia, organised by the Hong Kong Trade Development Council (HKTDC) and Messe Frankfurt (HK) Ltd, and co-organised by the Environment Bureau of the Hong Kong Special Administrative Region (HKSAR), was held at AsiaWorld-Expo from 25-28 Oct to facilitate exchange among those working in green industries. Located upstream on the Xijiang River, Shaoqing is something of an ecological oasis in the Greater Bay Area. To help protect the local environment, the city has long been a keen supporter of the local green industry. Cheng Haibin, Director, Zhaoqing Environmental Protection Bureau, explained how the city has set four environmental protection objectives, including raising the green industry's value from Rmb$10 billion (about HK$11.4 billion) to Rmb$100 billion (about HK$114.6 billion) over a three-year period; accelerating the environmental upgrading of traditional industries to reduce pollution; maintaining the water quality of the Xijiang River; and promoting the automatic treatment of sewage and waste in urban and rural areas to improve people's living conditions. The city of Foshan is also working to promote the development of the green industry. Qu Shejian, Deputy Director, Foshan Environmental Protection Bureau, said the local government promotes environmental protection in a number of ways, such as setting up environmental-protection funds to support enterprises and projects beneficial to eco-development, and collaborating with academic institutions such as Tsinghua University and Sun Yat-sen University to help local enterprises upgrade their businesses through new technologies. Rapid economic development in Zhongshan has left the city facing a continuous increase in the amount of solid and hazardous waste produced. Cao Yingzi, Deputy Director, Zhongshan Environmental Protection Bureau, noted that more than half of the city's hazardous waste produced last year needed to be shipped out of Zhongshan for processing. Ms Cao said that Zhongshan was still behind the curve in terms of treating hazardous waste, which is why the city is now working to establish a comprehensive hazardous waste collection and transportation network, reducing waste at source where possible and implementing comprehensive process management as part of Zhongshan's future environmental development plan. The forum's focus later shifted from the Pearl River Delta to the Yangtze River Delta, where Shanghai - the economic powerhouse of the mainland - also needs to address urgent environmental issues such as air and water pollution. Bai Guoqiang, Chief Engineer, Shanghai Environmental Protection Bureau, said that although both air and water quality in Shanghai have been steadily improving, the large population and shortage of land meant the city still faces significant structural pollution issues. In response, Shanghai has devised a strategic plan that will strengthen the city's environmental governance, at the same time helping to put other Yangtze River Delta cities on the path to sustainable development. Huang Jianping, Chairman, Guangdong Provincial Cleaner Production Association, said that the gross domestic product (GDP) of the Greater Bay Area amounted to more than Rmb$10 trillion (about HK$11 trillion) last year, exceeding the GDP of the San Francisco Bay Area. However, she stressed that the Greater Bay Area's environmental performance in areas such as air and water quality was still lagging that of other bay areas. Ms Huang added that the Greater Bay Area plan will drive integration and environmental collaboration in Guangdong, Hong Kong and Macau, and explained how the National Development and Reform Commission's agreement to establish an environmental development alliance between the three places will further strengthen collaboration among Greater Bay Area cities. Ou Jun, Deputy Secretary General, Guangdong Association of Environmental Protection Industry, told forum participants that various national and provincial green policies have been unveiled in quick succession, strengthening the rectification of issues related to air, water and soil pollution. He added that environmental inspections initiated by the Central Committee of China Environmental Protection Supervision Committee have led to more stringent action against environmental violations and helped to ensure companies' compliance with environmental regulations.